Rumers have been circulating for a while now about a redesigned Petzl Stop being in development and test. The first pictures have now emerged following an expo in China. Thanks to Qi Woo for posting these on the Rope Test Lab Facebook Group. I have made a few limited observations based on these few images. From this pre-sale version, we can see the device remains an assisted braking descender but is now marked as certified to EN 15151-2 (2012), which is the “Breaking Device” standard and indicates this can be used as an assisted belay device, which the previous version was not certified to. This would be a major draw for instructed caving where there is a shift away from ‘historical’ use of the current Stop and towards devices with full certification for each job we ask them to do while at work. It’ll be interesting to see this new Stop go head to head with the RIG2 device which is being picked up by more and more cave leaders. The new Stop is compatible with 8.5mm to 11mm ropes, which just about covers the full range of diameters cavers are likely to need, although not quite down to the 8mm stuff which is becoming more popular with sport cavers. 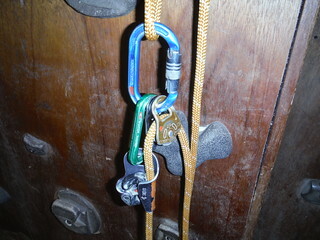 Interestingly, the new Croll S is compatible with 8-11mm rope. The assisted braking / control handle has changed from a push-in to a pull-down style operation, much like the Petzl RIG or Kong Indy Evo, something that will be welcomed by some, but disliked by others. I am happy about this, as I’m someone who has started to develop hand pain from the current squeeze operated handle after longer trips or many lowered clients. The device no longer seems to have user replaceable bobbins, as evidenced by the lack of hex head nuts and bolts on the frame. It does seem that both bobbins are made from the same metal, making me think this is a full stainless steel bobbin device, which should give much longer lifespan over the alloy bobbin version. We should also see an end to grey ropes in the kit store now there is no alloy to wear and coat the rope. We’ll need to wait and see what that little hole is for in the handle. Remote braking release perhaps or just a pre-production moulding feature? I have not seen a release date for the UK market yet and I look forward to getting my hands on the user instructions when they are issued. What will be very interesting to see is specifically how Petzl supports the use of this device for lifelining (and rescue hauling) as it might be used in instructed caving. Could this be the Stop we’ve always wanted, or will the professional caving market continue to migrate to the excellent RIG2 device, with its multi-function EN standard compliance? In addition to the Stop pictures, we can see a completely redesigned Freino krab, with its braking spur repositioned to the opposite end of the karabiner when compared to the previous version. Eagle eyed readers will spot that this krab is attached to a red device in the photo below. We are also looking at a new version of the Petzl Simple. This does still have hex head bolts so may retain its user-replicable bobbins. They bobbins even seem to be symmetrical, making them reversible too. I’m sure we’ll see more in the coming weeks. The North Wales panel of the Local Cave & Mine Leader Award scheme has just run a block of courses based out of Oaklands OEC near Llanwrst. I am a member of the N Wales panel and I will be working alongside other T/A’s as I move towards completing my assessor apprenticeship. The centre was host to 2 full LCMLA Level 1 Mine training courses and a full Level 2. 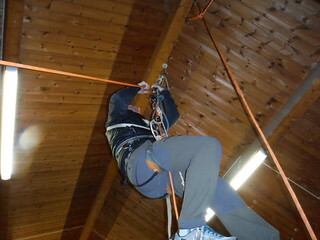 There were also a number of people on mine to cave transfers and 1 person on a 3rd day of cave training. I worked alongside Nige Atkins CIC, one of the UK’s most experienced trainers and it was a pleasure to absorb his knowledge. 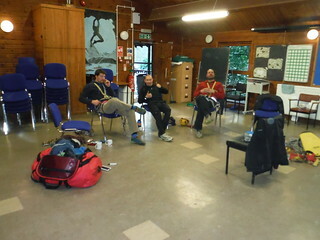 We ran day 1 from Oaklands OEC, in their annex building, where there was a small but amply equipped training wall. This venue is a perfect base for LCMLA courses and technical training. Day 2 started with an introduction to tyrolean traverse rigging and then it was off to a local mine to put it all into practice. We set a 40m floating SRT line for longer spells of practice on the rope. Course members and Nige taking a break. The first day was a relaxed, candidate-led workshop environment where we managed to cover a huge amount without needing to follow a rigid plan. 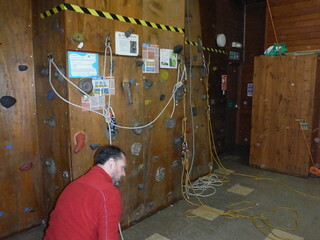 The candidates were a great bunch and it was nice to have a mix of other outdoor qualifications in the room. If you are interested in becoming a BCA cave leader award holder then the first stop for you should be the BCA Training web pages. You need to register for the LCMLA scheme before Level 1 training and this registration will take you through the whole LCMLA scheme. On the 27th July 2013 a storm hit the UK, falling on dry ground and empty watercourses the rainfall soon entered the cave systems of the Peak District. My wife and I took the opportunity to visit Bagshawe Cavern in flood condition. WARNING – Never enter a cave in flood or at risk of flood without proper experience and training, even then think twice! Both myself and Beth have visited Bagshawe dozens of times and know it intimately. Over the previous 30 days up until the 27th July the Castleton area had only received 26mm of rainfall according to the Peak District Caving Info website. Rivers were very low and underground, the streamways and sumps of the Peak District were in a typical very low summer state. The ground conditions were dry, not parched as there had been 11mm of rainfall on the 23/7/13. Observations after this rain showed no change in surface or underground streamways. At 20h00 on the 27th July 2013 a storm from the South began to pass over the Peak District. Approximately 80mm of rainfall fell in the area over the next 12 hours. This caused localised flooding, swollen rivers and streams and, as expected, flood conditions underground. We made a visit to Bagshawe Cavern at 15h00 on the 28th July, 19 hours after first rainfall. We made our way upstream to the area just before the 1st crawl up and over rocks on the left. We could have got through but it would have been a swim. The stream level varied from calves to knee deep. You could visit the initial main sections of the system today without risk of flooding, from the entrance to the base of the steps by the Dungeon Pitch. Although more drippy than usual, the puddles in the miner’s level hadn’t filled back up to normal high levels and were surprisingly still low. Across the hill, Peak Cavern’s resurgence had gone from the lowest level for some time to full-on flood level discharge in 12 hours. This speed and volume was interesting as the system normally shows more of a delay in response during Summer. Something to consider there for all leaders in the system.